While combing through old documents at an antique store, I discovered this humble piece of paper. Fortunately, I was able to have it digitally restored as the paper was severely torn and the ink had faded. 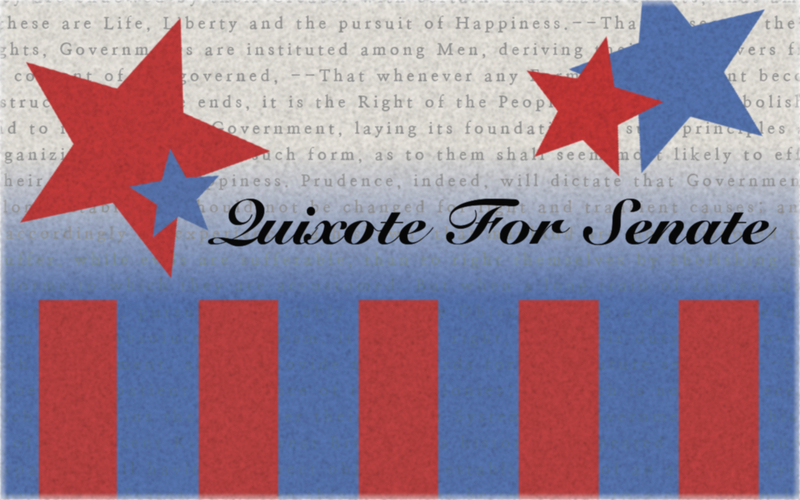 I suppose Quixote himself had created it before he embarked on his campaign. The flyer reflects his patriotic pride, but the design is rather poor. I speculate that his first attempts failed, and then he haphazardly created another without giving much effort. What’s up with those red columns on the bottom? They stick out like a sore thumb. And, should I mention that the paper was as thin as an onion’s skin? It seemed that the old clerk at the antique store had some recollection of his campaign. He laughed as he told me, “I’m s’prised that fool lasted so long. He just made ev’rybody stare at him. It was pretty obvious he was off his rocker, if ya know what I mean. “I used to have this job at a hotel back when I didn’t have this (pats his potbelly), and I remember when he stayed the night right after he started his campaign. I think it was some holiday ’cause the whole place was filled to the brim with reservations. He came in after 10pm and asked me for a room. I told him we were plumb out, and he used a bunch of big, fancy words to tell me that he’d take anything we had. I thought he must be real important, so I pretended to be educated too and said he could stay in the room with the busted air-conditionin’ unit. “Next morning, he grumbled about there being nothing to eat at the continental breakfast. He wanted something vegan or gluten-free and made us get the old tofu out of the backroom. To be a little nice, we moved his little table near the air-conditionin’ vent, ’cause we figured he probably would enjoy the some cool air after that last night. He looked real funny though ’cause he was a little sweaty and was shiverin’ next to the vent. And he had a real hard time eating that tofu in his stiff suit and tie. “I started to see he was nuts and figured he could give us something to laugh at, so I asked him to make a speech later in the evening. I told him that we didn’t have a proper speakin’ hall, so he would have to use the parkin’ lot. He was grinnin’ from ear to ear with excitement and rambled about freedom of speech and the right of the people to gather. I told him it could cost a small fee, and he said he hadn’t received any money from his campaign sponsors yet. I gave him a little talking to about how politicians should always make sure to raise enough money so they can have lotsa speeches. “I told him how it all would work, and he promised to be there. Lots of the guests wanted to be there – I think we had maybe 80 people outside. He paced ’round on the curb under the streetlights, and just kept goin’ on and on about freedom and equality and justice. When everybody heard what he had to say, they were sure he was insane too. “Then some old chauffeur got into a car and started it, and old Donnie Quixote became furious. He stomped over to the car and yanked the man out of the car. Very loudly, he shouted, “How dare you impede the advancement of liberty by causing these citizens to not hear the magnificent words of freedom! You ought to be ashamed of yourself!